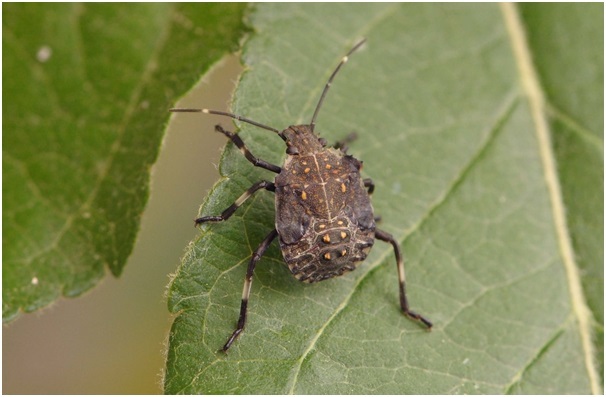 Pest Control News has confirmed that their prediction has become a reality: The brown marmorated stink bug is in southern England and it poses a risk to plants and fruit crops. Even your humble allotment or garden apple tree could prove too tempting for these Asian natives. P.C.N. has reported a definite sighting in Hampshire in November 2018; the pest was inside an external rodent bait box. Pest control specialists including Pest Control Berkshire, who also serve neighbouring counties, are remaining vigilant and would ask the public to act if they suspect that a brown marmorated stink bug (or many of them) is overwintering in the locality. Its Latin name is Halyomorpha Halys. The adult form is approximately 17mm long, brown, winged and mottled – marmorated means marbled or streaked – with lighter shades on the antenna. Expect to see copper tints or metallic blues on their heads and pronotum, the shell-fin on their thorax. Their scent glands are on the underside of the thorax and on the surface of the abdomen; these produce a repulsive odour. If they are crushed or disturbed a strong stink will make itself abundantly clear to your nasal passages. This stink has caused an allergic reaction in the USA and contact with a crushed bug could produce dermatitis on the skin. If you find yourself in the company of the stink bug and feel unwell, please seek medical assistance. They tend to cluster in buildings in large numbers and cause a public nuisance. Peak times are in autumn as the weather cools and again in spring as temperatures rise. An infestation can take hold on walls, windows and door frames and in commercial spaces it is wise to check that roller-shutter casings, areas behind panels and roof spaces are clear of an invasion. Are crops safe from harm? These bugs damage fruit crops; often apples, nectarines or apricots but their tastes extend to vegetables, raspberries and blackberries, according to European studies. The bug has over 300 host plants around the world; the introduction of ornamental plants to overseas markets is suspected for infestations. Is this the first ever sighting in the UK? No. Four of the five previous sightings reported to the authorities since 2010 were related to imported goods and inbound luggage. The November 2018 sighting was by a pest control professional working on a case. Why is it important to get a professional evaluation of its presence? This pest can be confused with other similar but not as invasive or threatening pests. A pest control specialist knows what they are looking for, so they can eliminate any other species of beetle or bug as they assess your discovery. They also appreciate the correct procedure to follow if the pest is identified as an offending stink bug. Please don’t guess or use an over the counter pest control treatment; always hire a professional for peace of mind. To learn more about the threat of an infestation, please contact Pest Control Berkshire’s team today.